My style of clothing and how I wear it will never change but the colour palettes do more than anything! Right now I'm loving the idea of bright blues (though I'm not a blue kinda gal) and brights greens. My hair is a small issue being red... But Ariel wore pink and blue as a walking girl and had a green tail with a purple shell bra as a mermaid so how can I say I can't wear certain colours as a red head!? Either way, I can see myself rocking the tulip skirt with a cute white logo tee or the Sahara dessert dress for an earthy boho look. I'm really into buying lots of different bottoms since I have so many tops at the moment, and in haven't got a variety of bottoms really. I have one too many pairs of denim shorts and blue jeans, but I haven't one maxi skirt or a pair of long length shorts - I need to add some change and versatility to my wardrobe! 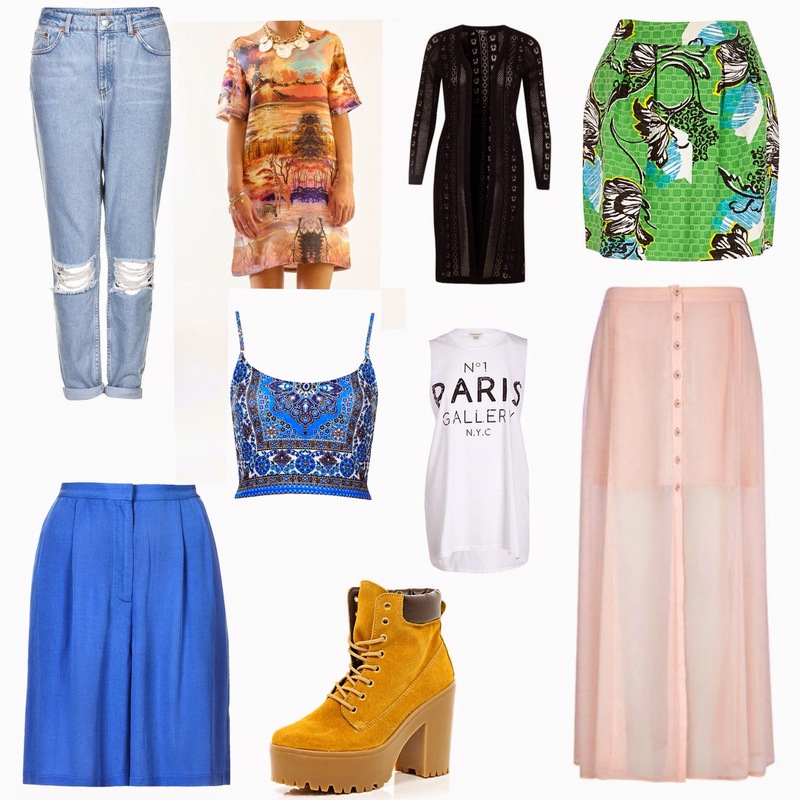 I'm also adoring the print on the crop top from Topshop and I NEED those worker boots. Basically timberlands with a heel.... Omg. I did want the Nirvana ones from Jeffrey Campbell but they seem so OTT and these a little more tame.... I'm still torn between the two but I need a pair of those beauties to match John ;) is that sad? Or a cute couple thing? I think I need them.... Argh! Also, want to share my username for Depop! I'm sure you all know what Depop is but I'm selling a few pieces on there, I need to get rid of things that don't suit me anymore... But I'm sure there are loads of you lovely ladies who might fancy giving them a new home since they're still in great condition. So if you have Depop, leave your usernames below and follow me on @CatttSays! I'm buying as well as selling so make me an offer and let's shop together!